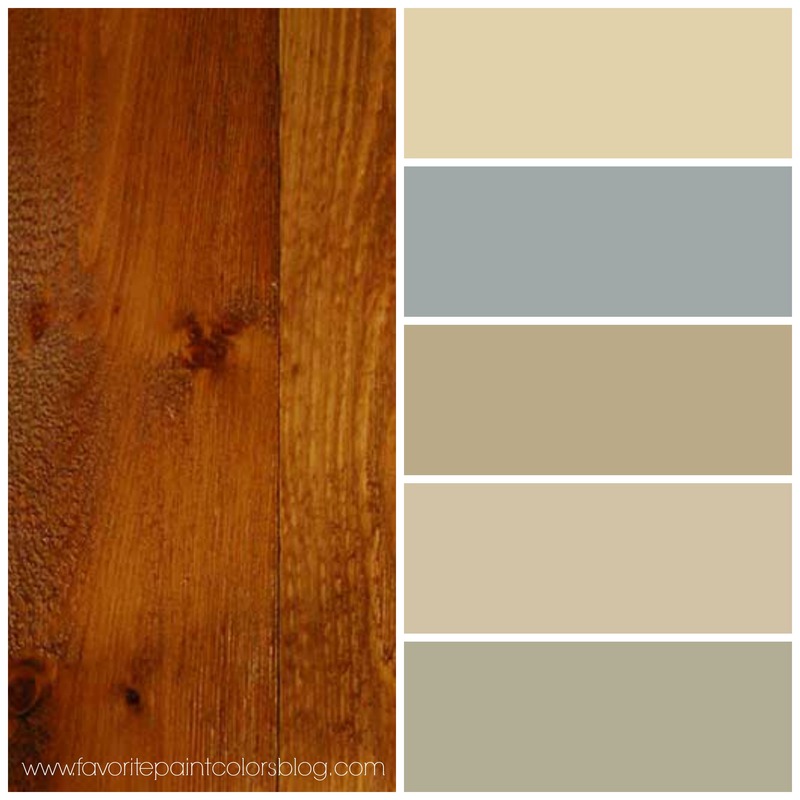 One of the most frequently asked questions I receive is about paint that coordinates with wood. 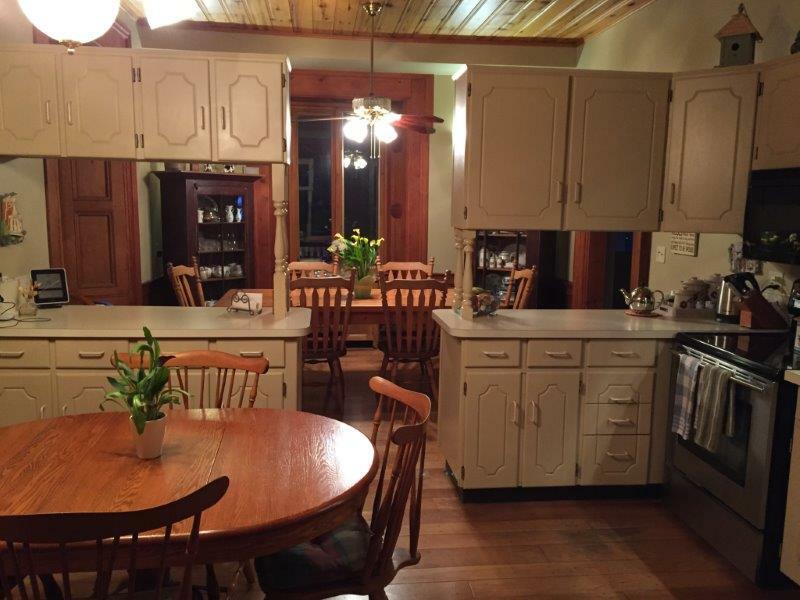 I had a reader contact me the other day, wondering what to do about her kitchen cabinets and wall so that the colors would work well with her red pine trim and doors. The woodwork in her home is beautiful, I love the big fat trim around the windows, the hardwood floors and the red pine doors. As you can see the ceiling is also planked wood, but she is planning on covering that up with drywall and then painting it white to lighten up the kitchen. She is also getting new custom cabinets, and a new quartz countertop. 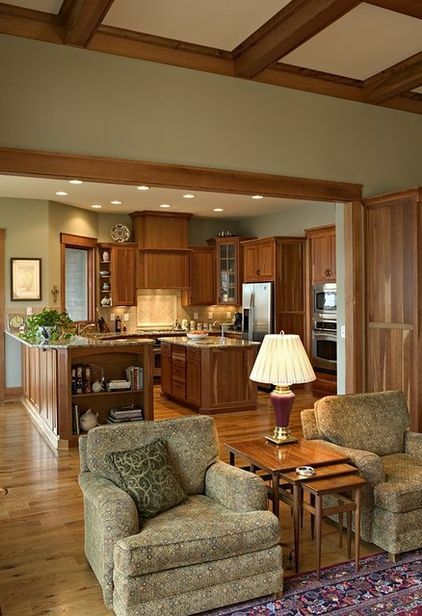 Her question was what color to do the cabinets and the walls to coordinate with the red pine she has in her home. Her contractor suggested she go with blonde maple cabinets, and she wanted Sharkey Gray by Martha Stewart to go on her walls. I put together a palette so that she could see what that might look like with the wood, and also added a few other greiges that I think would go great with Red Pine. From top to bottom the paint colors are Agreeable Gray by Sherwin-Williams, Sharkey Gray by Martha Stewart, Pismo Dunes by Benjamin Moore, and Revere Pewter by Benjamin Moore. I love all of these colors because they are warmer greiges, which you want you have a warmer wood such as red pine. 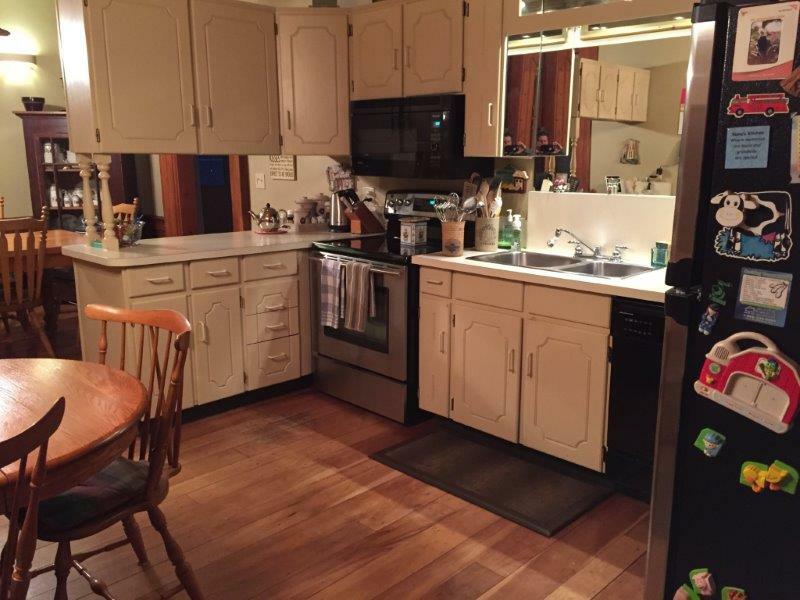 Debbie has been going back and forth between blonde maple cabinets and painted. I told her that either one would work, it just depended on the décor style she was looking for. Mixing woods can be very beautiful, but to me the wood in her kitchen would really pop if she went with painted cabinets. I found some inspiration pictures with woodwork and I love the beauty of the wood itself when the rest of the room is a neutral color. My go-to color for white cabinets is White Dove by Benjamin Moore. It’s got a touch of cream to warm up the color and it doesn’t have any weird undertones. Alabaster by Sherwin-Williams is an identical match to White Dove if you prefer Sherwin-Williams. With wood, I love beiges, creams, greens, and blues. Here are some of my favorites from each category I listed above that would look great with warm, wood trim. Starting at the top: Ivoire by Sherwin-Williams – a light cream with a touch of yellow. Network Gray by Sherwin-Williams, a great blue-gray that is a good contrast with wood trim. Here is an example of blue with wood. The middle color is Huntington Beige by Benjamin Moore. A great neutral with a hint of brown. Crisp Khaki by Benjamin Moore– a great tan that would work well with any type of wood trim. The last color is Svelte Sage by Sherwin-Williams. I love green with wood, as I’ve mentioned before it’s natures best combination. Here is an example of a sagey green with wood. I hope this helps when trying to decide the best paint color to go with your wood trim. 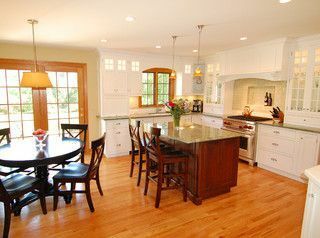 I also hope to follow up with you and show you the transformation of Debbie’s kitchen and let you know what she decides. 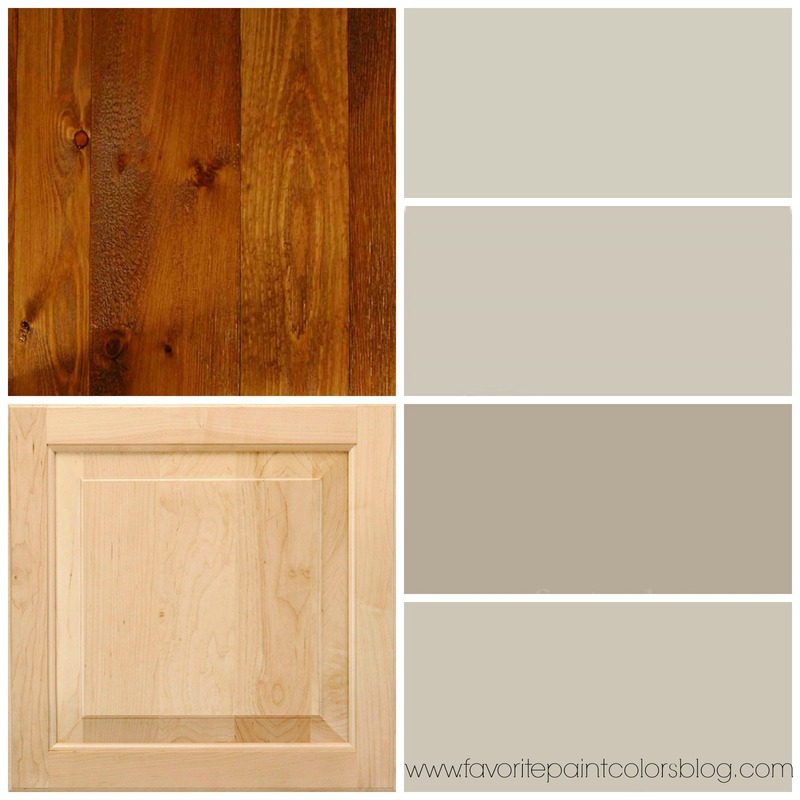 For more posts I have done on paint colors to go with wood trim and cabinets, see here. Have a great day!